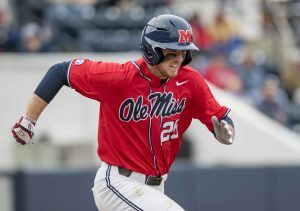 Ole Miss opened SEC baseball play with a series win over Alabama this weekend and, despite a shaky start to the series, slammed the door on the Tide with a 12-2 victory Sunday afternoon. Ole Miss’s recent offensive woes continued on Friday, as the Rebels edged out a 1-0 win on the arms of Will Ethridge and Parker Caracci, with offensive help from a solo home run to right field by Cole Zabowski in the second inning. The rest of the Rebel lineup was stagnant, however, as the team combined for 6 hits and left 7 men on base. Saturday brought a loss for the Rebels after a brief start by Zack Phillips on the mound. Ole Miss infielder Tim Elko runs at the series against Long Beach State earlier this season. The Rebels won in the series against Alabama this weekend with a final score of 12-2. Photo by Christian Johnson. Although Phillips gave up no earned runs, he walked 4 before giving way to Rebel relievers for the rest of the game. The Crimson Tide bats combined for 8 runs on 13 hits, as they erased an early Rebel lead to top Ole Miss 8-6. The Rebels and the Tide were even at 6 runs through the seventh inning before Alabama’s Drew Williamson doubled down the line to bring in two runs in the eighth. Rebel relievers Taylor Broadway, Connor Green, Doug Nikhazy and Ryan Olenek were pegged for 12 of those 13 hits, and the bullpen surrendered 6 of the Tide’s 8 runs, 5 of which were earned. Sunday saw multiple changes in the Rebel batting order, as head coach Mike Bianco looked to wake up his team’s cold offense. As a result, Ole Miss racked up 10 hits and 12 runs behind a solid starting pitching performance from freshman Gunnar Hoglund, routing the Tide 12-2. One Rebel who seemed to benefit from the shakeup of the batting order was shortstop Grae Kessinger, who accounted for 3 doubles and 5 RBIs. Five other Rebels got into the hit column on Sunday, with Tyler Keenan and Cooper Johnson each acquiring 2 hits. The Rebels’ series win puts them at 14-6 overall and 2-1 in SEC play heading into two midweek games with Arkansas-Pine Bluff and a weekend series on the road against the Missouri Tigers. They’ll remain on the road for the rest of the month, with a stop in Memphis on March 26 and a stop in Fayetteville for a big series against No. 10 Arkansas the weekend of March 29. Following Sunday’s game, Bianco said he plans to have a new starting pitcher take the hill this Saturday against Missouri. He did not venture to say who would throw for the Rebels in game two of the series against the Tigers. It will likely be Doug Nikhazy, who has seen midweek starts and relief duties for Ole Miss so far this year. Nikhazy has a 4.15 ERA, but outside of a couple of bad innings against nationally ranked East Carolina and Louisville, he has been solid on the mound. With the change in the pitching rotation, Jordan Fowler and Zack Phillips will start this week’s midweek games against Arkansas-Pine Bluff on Tuesday and Wednesday, respectively.